Powdermill Reservoir is located near Sedlescombe on the borders of East Sussex and Kent and was constructed to provide water to the Hastings area. 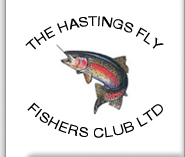 On completion of Powdermill reservoir in 1932, Hastings Fly Fishers Club was formed by a small group of like minded local anglers who have leased the fishing rights ever since. The 56 acre reservoir is stocked with rainbow trout of exceptional quality which have a reputation for being hard fighting and well proportioned fish. These rainbows are obtained from two fish farms. Hooke Springs Trout Farm, located in Dorset, has been in operation for forty years and Bibury Trout Farm in the Cotswolds is one of the oldest having been founded in 1902 Although there are sources nearer to us, we consider that these two farms produce the best stocks available in the UK. There is also a good head of resident brown trout which should be returned when caught. Although the membership of the club is small, it is very active and growing all the time. New members are always welcome, as are visiting day-ticket anglers who will find that club members are always happy to pass on current information concerning where to fish, tactics and flies to use. Powdermill reservoir also has a reputation for exceptionally good Mayfly hatches and the reservoir is very busy when news of the hatch gets around. Although some anglers prefer to bank fish, the boats are extremely popular. A wheelie boat is also available.